ORGAN THING: Stoned Love? Lemons over Manchester? Evil on my mind? No time for anything today, a thing-free day, here, have some speculation…. 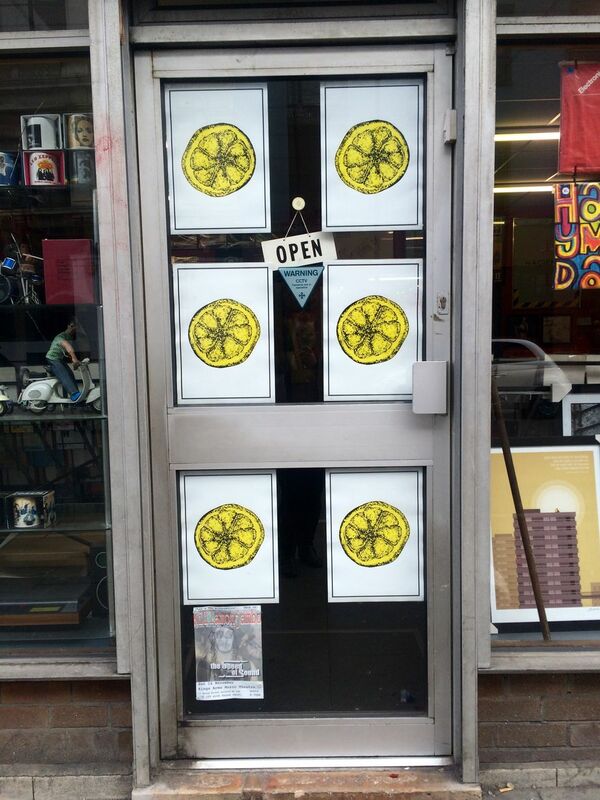 Speculation about a Stone Roses album and tour has reportedly “hit fever pitch as posters of their iconic lemon logo popped up in shop windows in Manchester”. Meanwhile, rock stars including Tim Burgess and Liam Fray have tweeted lemons too. “Every reference has 16 lemons, suggesting a tour could take place in 2016”. The band, who reformed in 2012 for three huge shows at Heaton Park and a world tour, have yet to release their much anticipated third album. Promoters SJM would not confirm that an announcement about the band was on the cards but the term ‘stoneroses’ was trending on Twitter by 10am as excited fans braced themselves for news.. Posters were seen in Manchester at the Close barber’s shop, on Greater Ancoats Street, as well as the Vinyl Revival record store, on Hilton Street. Here’s some imagery blatantly stolen from the Manchester Evening News.